The Antiquity of Man. Philadelphia: J. B. Lippincott; London: Williams & Norgate, . Arthur Keith was a noted English anthropologist and an early champion of Piltdown Man. 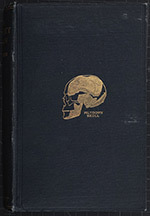 He even had the Piltdown fragments embossed in gold on the cover of this book (see the wall panel, “Piltdown Man”). Inside the book, Keith included a genealogical tree of human ancestry, much more detailed than the one that Haeckel had first constructed in 1874 (see item 19). One can see that Keith has Piltdown (Eoanthropus) as the last “dead” shoot before the appearance of modern man, with Neanderthal a little lower down, and Java Man (Pithecanthropus) lower still. 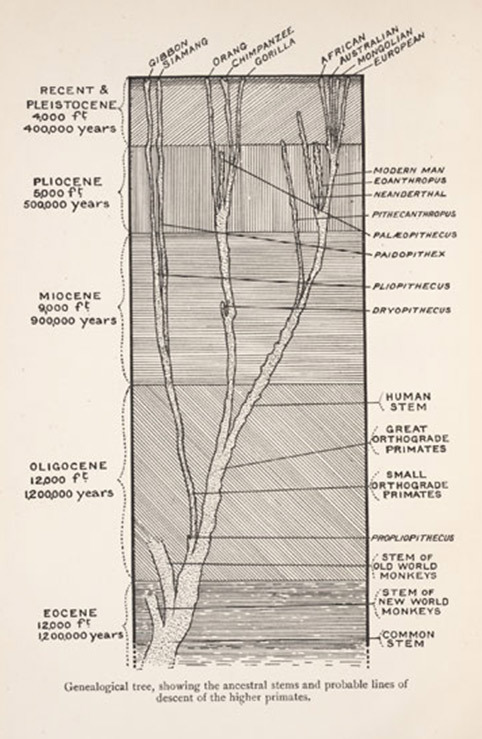 This graph also exhibits a Caucasian bias that was characteristic of the time, with “European” furthest to the right, as if that branch were more advanced than the other living races of mankind.